Bon Appétit | Kid Reporters' Notebook | Scholastic Inc. 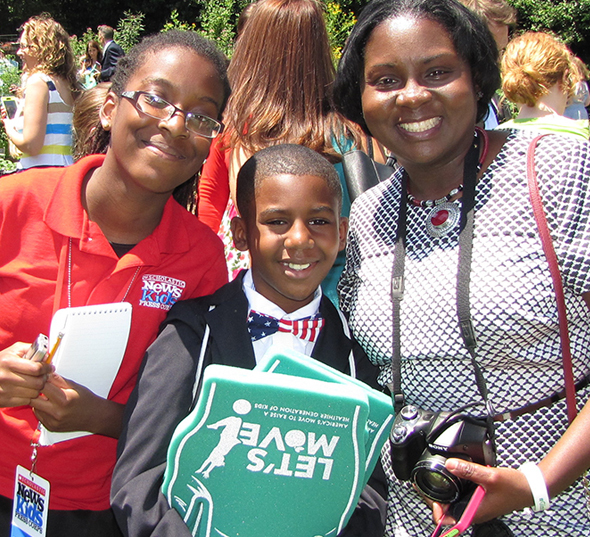 Kid Reporter Abigail Wilson-Kageni at the White House with Samuel Davis and his mother, Roslyn. Have you ever dreamed of creating your own recipe? What type of dish would you make? This year, students from all 50 states, the four territories, and the District of Columbia, accepted the Healthy Lunchtime Challenge, a recipe contest that is part of First Lady Michelle Obama’s Let’s Move initiative. The competition drew nearly 1,000 entries from kids ages 8-12. On July 10, the First Lady hosted a “State Dinner” at the White House for the 55 students whose recipes were chosen as the most delicious and most nutritious. “America’s kids are passionate about not just eating healthy food, but about cooking healthy food, too,” she said. Scholastic News Kid Reporter Samuel Davis, 11, was among the winners. He took top honors in Louisiana for “Sam’s Southern Savoring Salmon Supreme (S to the 5th Power)," a recipe that he created using ingredients from his family's garden. The dish was among the First Lady’s favorites. After the meal—which was actually a luncheon—cast members from the hit musical Aladdin performed. Eva Paschke, 9, of Michigan, won top honors in her state for her “Fizzle Sizzle Stir Fry,” which includes brown rice, fresh ginger, and red pepper flakes. I asked Eva what advice she had for other kids who might want to enter the contest next year.